Multilingual study is not a new thing in India, but it is a paradox that in a nation of so many languages, many of which are well developed, the amount of theoretical orientation in the field of bilingual or multilingual study is practically negligible. So far, no serious attempts have been made to bring together any two languages through a comprehensive syslematic contrastive grammar. The present work, with its limitations, is a modest attempt in this direction. Hindi and Tamil are two most important languages of India, genetically far apart from each other and showing a lot of difference in their formal structures. Hindi as the most widely used Indo-Aryan language of North India, and Tamil as the most representative among the Dravidian languages spoken in South India, have special importance among the languages of India. It is generally believed that Hindi and Tamil are structurally nearer to each other than either Hindi and English, or Tamil and English. This, however, is true only to a very limited extent, and should not lead one to the conclusion that Tamil and Hindi are so near to each other, that the speaker of one does not encounter serious problems while attempting to learn the other. Though there are some similarities, especially in Syntax, the differences are nevertheless alarming. This is true of all levels from phonology to semantics. While the phonemic pattern of the two languages are quite different, creating extremely difficult, if not unsurmountable, problems for the speaker of one to learn the other, the differences in morphological formations, and the semantic variations are also considerable. Even in the case of syntax, the similarity should not be over estimated. Except perhaps in 'the order of word' in a phrase or a clause, there is nothing that can be said to be specially similar with regard to 'the syntactic features. Even small sentences like 'This is a book' or The mango fruit is sweet' show a syntactic difference in the two languages, Tamil expressing the idea without a copula verb, while Hindi having it as obligatory.' A single morphological form in some syntactic contexts in one language may have diverse equivalents in the other. Thus the' contexts covered by the Infinitive of the verb (which is never inflected) in Tamil are covered in Hindi by (1) the root, (2) the un-inflexible infinitive, (3) the inflexible infinitive, (4) the oblique infinitive and (5) the oblique infinitive followed by a case-marker. A study of the Cases will reveal many differences in the areas of their meanings and uses. 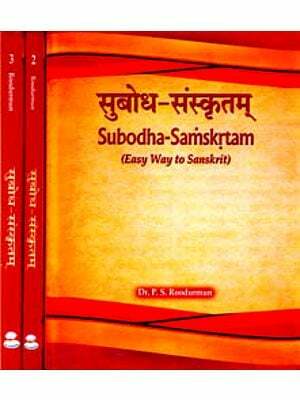 At the semantic level, several Sanskrit words used in both the languages may show superficial similarity, but have entirely different meanings or different semantic fields. All these make it imperative to make a contrastive study of both the languages at all levels, namely phonology, morphology, syntax and semantics. This work is the outcome of realising such a requirement. 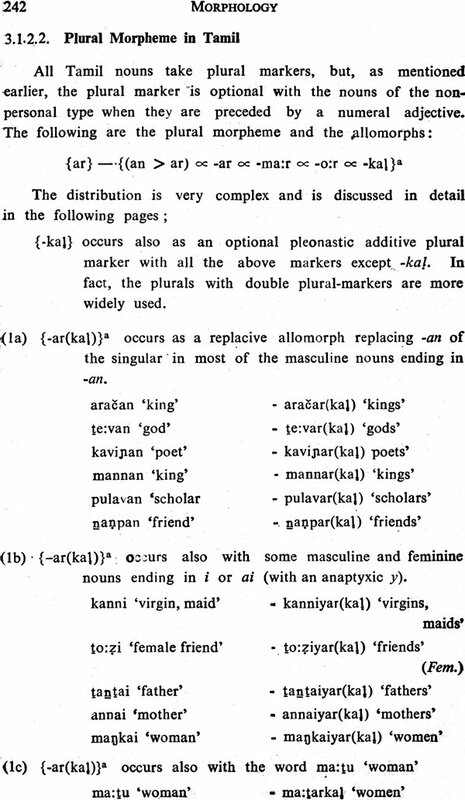 Though the author was contemplating a sort of bilingual comparative grammar without much formalisation, while teaching the students of South Travancore Hindu College, Nagercoil, during 1950-'54 and 1958-'60, and had actually prepared most part of it, the work could be done with more comprehension and precision only after taking it up as a full time departmental work in the University of Madras. His association with the Summer Schools of Linguistics and contact with the scholars connected with them gave him the courage to take up the work. Meanwhile, a few papers dealing with some marginal aspects of contrastive grammar were either presented in linguistic conferences or published in journals. The reception they got also was encouraging. On taking up the grammar as a departmental work, fairly exhaustive study of both the languages was made with the definite purpose in view and using all available sources, casually heard conversations, formal speeches, broadcastings, newspaper reports, creative writings and grammars. One of the biggest difficulties was to decide which forms of the languages were to be taken as standard to be described, and contrasted. 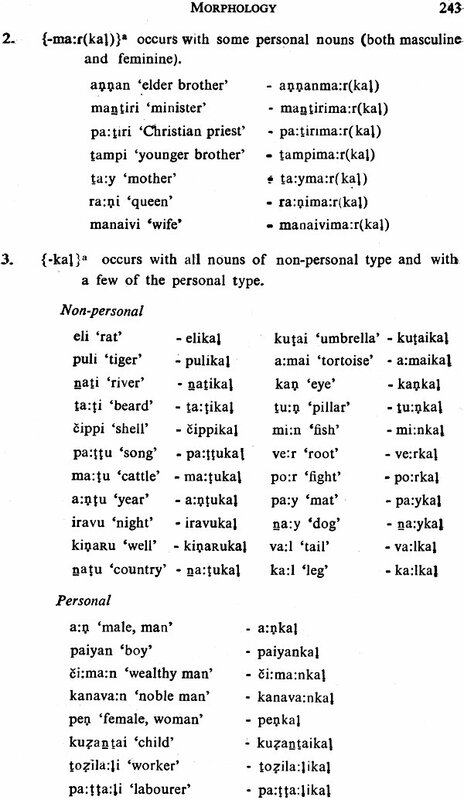 Dialectal variations are many, and it is difficult to take anyone regional form as the representative standard form. What is chosen for analysis here is the common-place literary not too elite language which is used in formal talks and common correspondences, and this language in its spoken and written forms has been analysed and described with emphasis on the contrastive features. This is true in the case of either of the languages. At times dialectal variations have been noted, if they were found important. Highly literary Hindi and Tamil, the former using a larger measure of Sanskrit words and forms, and the latter preserving several features of ancient Tamil, show some slight variations, though the grammatical core remains the same in either case. The author has had before him no model of a complete contrastive grammar, nor even complete structural analyses of the two languages under study. However fragmentary studies are available in a fairly large number. Excepting the limited material available .in these studies, the contrastive study was mostly done independently without any commitment or inhibition towards any model or either of the languages. The study is not a purely theoretical one. The main purpose of bringing out the contrastive elements being providing practical aid in learning and teaching of language, this practical use has also been kept in view while analysing and presenting the material. Even where description can be done with more economy, it has been preferred to give plain longer statements rather than more-compact but abstruse enunciations. Though a little more theorising using modern theories of linguistic analysis would have given a more precise and more accurate description, no such attempt has been made, because it, is desired that the language teachers, and writers of practical grammars with some knowledge of modern linguistics may also use the book. Complicated mathematical formulae have been avoided, Full and strict fermalisation has not been resorted to, but copious examples are given. The auther is fully aware of the limitations and even some inaccuracies in the various sections imposed by the attempt to make the book not too theoretical. It is also not claimed that the book] can be used as a direct practical aid in learning or teaching of either of the languages. Graded lessons introducing constituent elements and structures in a phased manner with adequate drilling exercises are indispensable for learning a language. This work does not provide these. The intention has been to give a theoretical foundation to learning Hindi or Tamil as a second language, by providing a full and in comprehensive analysis of grammatical features which are important from a practical point of view. It is hoped that the book will be of use in preparing teaching material and devising methodologies for instruction. The descriptive approach has been adopted in general and the contrastive features at various levels pointed out. Areas and nature of interferences have been detailed for the most part. The interferences have been mostly discovered from actual speech and written material. Where interferences have not been explicitly shown, it is assumed that the description of contrasts will enable one to predict the probable interferences. A strictly synchronic-descriptive grammar should avoid references to historical developments and earlier sources. This has not however been fully possible especially in the case of Hindi which shows different structural behaviours in the layers of Native-Hindi, Sanskrit and Arabic-Persian, of which it is composed. The analysis has been done with reference to the sources in many places. The alternate possibility is to list exhaustively the items under various classes, without reference to the sources. But such a classification also will be indirectly based on the sources. As such exhaustive lists are unwieldy and beyond the scope of this work, the multi systemic analysis with reference to the sources has been resorted to in some places. A very large amount of material has been collected from various sources, and the analysis of the individual languages will show that many points not dealt with in ordinary grammars find a place here. But this does not mean that every structural peculiarity of the languages has been brought in. The fields are so vast, that they can be hardly scanned comprehensively in a work like this. However, it is hoped that all grammatical forms basically needed for handling the languages have been adequately dealt with. The Introductory Chapter is a historical sketch dealing in short with the development and growth of the two languages under study. The First Chapter gives a complete PHONEMIC ANALYSIS of the two languages and shows the diaphonic relations, with a view to emphasise the points and kinds of interferences. The analysis is in the usual way, but some problems in the overlapping of nasals, in both the languages, are perhaps pointed out for the first time. Though a complete phonemic analysis is not fully relevant for a contrastive study, it was considered necessary in order to make the phonemic studies readily available for the users. Especially, the allophonic distribution of Tamil will be useful for the learners. A list of consonant clusters with examples given at the end of this chapter not only brings out the possible interferences but also gives the correspondences. This has been necessitated by the presence of a good number of words common to Hindi and Tamil (mainly from Sanskrit), which show some phonological variations.